Henna is a dye made from ground up leaves from the henna plant. It is used to decorate the skin in festivals and celebrations in several parts of the world. Henna tattoos can also be used as an alternative to permanent tattoos as they only last up to a few week. You can use stencils to insure your tattoos are placed correctly. The stencils can be used to copy the most detailed tattoo art directly to your skin. 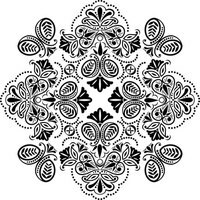 Choose what artwork or design you would like to use for your tattoo. Print out or draw the design onto regular copy paper. Remove the tissue from the transfer paper set. Attach the artwork to the transfer paper with tape to insure it does not slide around while you are tracing it. Trace over the tattoo design with a pencil making sure to trace every detail. Press down firmly to make sure the design traces through to all copies of your transfer paper.Once the design is traced it will show up in purple on the top sheet of the transfer paper. Cut the design out of the transfer paper. Wet the skin that will be tattooed with the alcohol swab and press the transfer paper onto the skin. Rub the transfer paper until the tattoo is transferred to the skin and then slowly pull the paper up off of the skin. You can now use your henna and trace over the stencil that has been transferred to the skin. You can also use water to wet the skin if you do not have alcohol swabs. Henna stains the skin for three to four weeks so make you pick a design you like and place it in an inconspicuous place if you will need to cover it up.